Many states are striving to keep their deer population to a sustainable and controllable level while maximizing public safety. In Iowa, measures to control the deer population include annual deer hunts and special deer herd management plans in urban areas. While these plans may reduce the deer population, traffic safety in these areas has not been fully assessed. Using deer population data from the Iowa Department of Natural Resources and data on deer-vehicle crashes and deer carcass removals from the Iowa Department of Transportation, the authors examined the relationship between deer-vehicle collisions, deer density, and land use in three urban areas in Iowa that have deer management plans in place (Cedar Rapids, Dubuque, and Iowa City) over the period 2002 to 2007. First, a comparison of deer-vehicle crash counts and deer carcass removal counts was conducted at the county level. Further, the authors estimated econometric models to investigate the factors that influence the frequency and severity of deer-vehicle crashes in these zones. Overall, the number of deer carcasses removed on the primary roads in these counties was greater than the number of reported deer-vehicle crashes on those roads. These differences can be attributed to a number of reasons, including variability in data reporting and data collection practices. In addition, high rates of underreporting of crashes were found on major routes that carry high volumes of traffic. 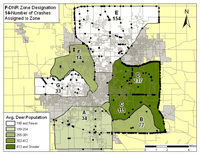 This study also showed that multiple factors affect deer-vehicle crashes and corresponding injury outcomes in urban management zones. The identified roadway and non-roadway factors could be useful for identifying locations on the transportation system that significantly impact deer species and safety and for determining appropriate countermeasures for mitigation. Efforts to reduce deer density adjacent to roads and developed land and to provide wider shoulders on undivided roads are recommended. Improving the consistency and accuracy of deer carcass and deer-vehicle collision data collection methods and practices is also desirable.